Nissan today flagged off the ICC Champions Trophy 2017 Nissan Trophy Tour in Bengaluru. The tour grants cricket fans an unexpected access to the ICC Champions Trophy. The trophy tour began its journey from Kolkata on March 01, 2017. After enticing fans in the city of Mumbai and Cochin it has now reached Bengaluru. The ICC Champions Trophy was greeted with excitement by all cricket fans in the city. As part of the entire journey, the trophy will be displayed in Kolkata, Mumbai, Cochin, Bengaluru, Hyderabad, Delhi NCR and Chandigarh. At events to be organized at university campuses, shopping malls, corporate parks and Nissan dealerships in these cities, fans will be able to get up close to the trophy, take 360-degree pictures with it, and play virtual reality cricket games. The tour will conclude on March 16, 2017. 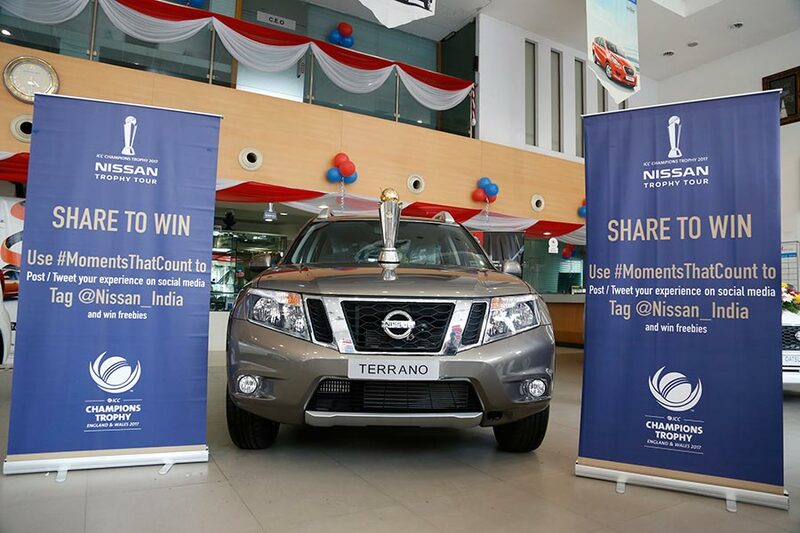 As global partner and supplier of the official car of the ICC, Nissan will be driving the ICC Champions Trophy in vehicles to events in seven major cities in India, as well as taking the trophy on some more unusual journeys to surprise and delight cricket fans. Nissan is also collaborating with the ICC to create a series of events that will bring fans together with the trophy and enable them to share their excitement and anticipation for the tournament. Cricket is a religion in India which binds the country together and we salute this spirit and are proud to be a sponsor of ICC Champions Trophy. India is the defending champion of this trophy and we at Nissan are excited to bring it closer to cricket fans across India. The ICC Champions Trophy 2017 Nissan Trophy Tour was set off on February 21 in Dubai. After India, the trophy will visit other competing nations like Bangladesh, Sri Lanka, Pakistan, South Africa, New Zealand, Australia and England, before the opening game between England and Bangladesh at The Oval on 1st June, 2017.